I can’t remember exactly what first triggered my interest in trainspotting. However, it must have been around 1955, sometime after starting at The King’s School, when I got together there with several like-minded friends, spotting as often as we could in the evenings and at weekends. Subsequently this interest was, strangely, aided by our mutual disenchantment with participation in the school’s Cadet Corps due to the itchy uniforms, heavy boots, interminable marching etc. So, having tendered our requests to leave the Corps, we were duly summoned before the Headmaster who, having registered his displeasure at our requests, then inflicted a penance on us all; one afternoon each week, when everyone else was taking part in Cadet Corps activities, we had to report to the School playing field, which we then had to weed with small hand tools not much bigger than a pen-knife. A real chore, you might think, but the playing field was, in fact, located right alongside the East Coast Main Line about half a mile north of Grantham station! So several hours of spotting was always guaranteed, often with something of interest appearing. In fact, it was on weeding duty there that I ‘copped’ my last A4, Edinburgh Haymarket’s (64B) 60012 Commonwealth of Australia on the Up ‘Lizzie’ (The Elizabethan) to complete the class of 34, accompanied by much merriment! After a while, we started cycling out to Barkston Junction after school – a trip of about 5 miles each way – whenever our homework commitments allowed. Barkston was a great place for spotting; there was a large flat mound of earth next to the Down Main line at Barkston Junction South which gave us an excellent view of all of the trains on the Main and Sleaford lines, and also on the Colwick line which crossed the road to Marston a few hundred yards further on, although some of the frequent WDs were far too grimy to identify! The Up Elizabethan was great to watch from this vantage point – you could see and hear it coming from a long way off around the sweeping curve and it was always going flat out when it passed by. Spectacular! 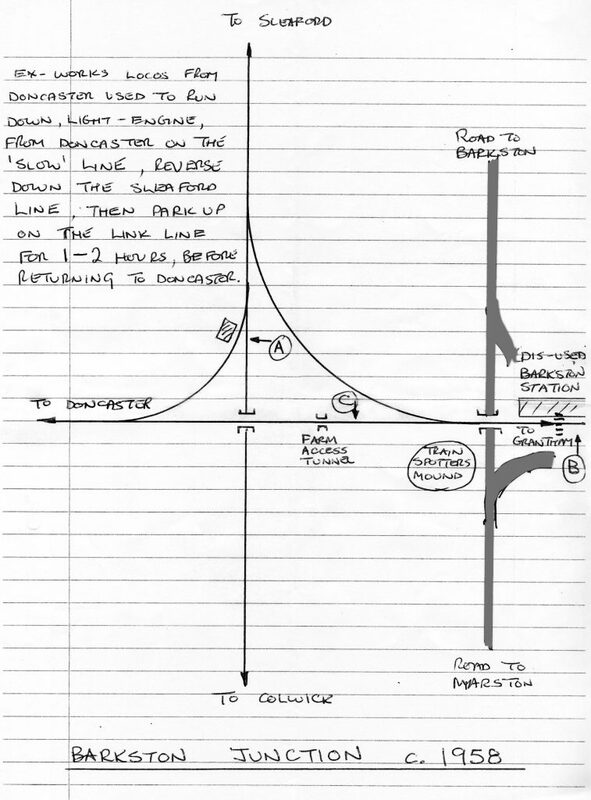 Here is a plan of the railway lines and road at Barkston Junction, explaining the route normally taken by 'Trials'. Points A, B and C show where my photographs were taken. 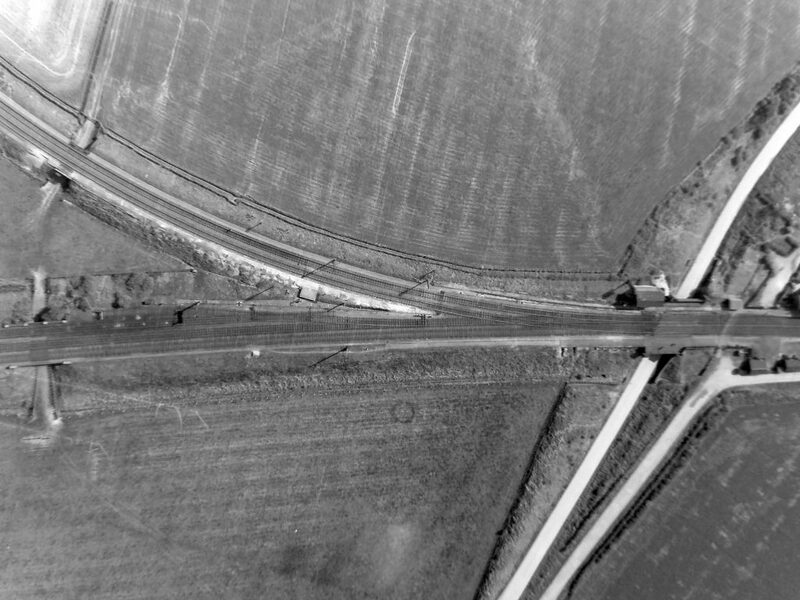 This aerial view of Barkston South Junction shows the signal box middle right with the 'train spotters' mound' on the opposite side of the line, and farm access tunnels through the Main line and Sleaford line embankments at far left. These after-school trips were not aimed at the normal service trains, however. We always cycled out to Barkston Junction at top speed in case what we were hoping for was preparing to depart, a wisp of smoke from over the fields near the Junction causing us to pedal even faster. The reason for our haste was one of the main attractions of Barkston - the possible appearance of a ‘Trial’. These ‘Trials’ were locomotives fresh from overhaul at Doncaster Works which were on trial runs before being returned to their home depots. 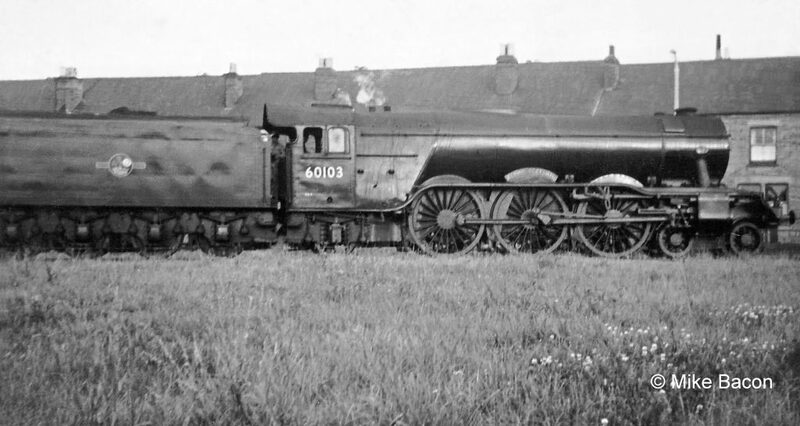 Sometimes these were locos which would never normally be seen in the Grantham area, such as those which operated from sheds in Scotland or East Anglia. 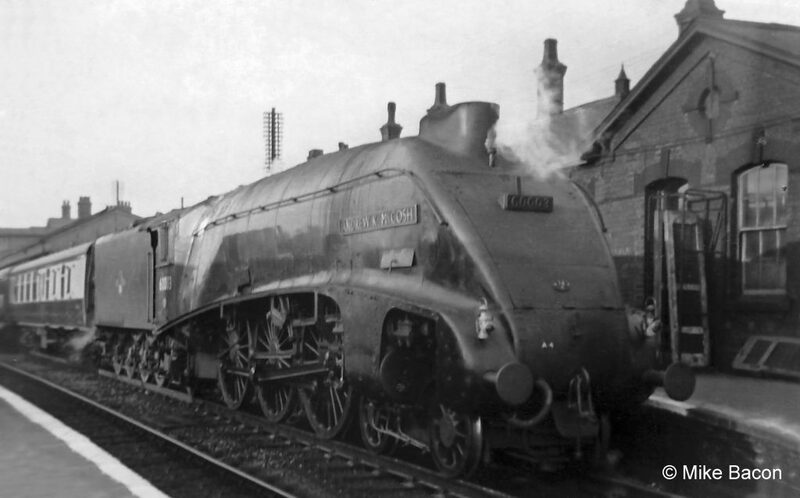 Normally such engines, with their glistening paint and gleaming steel rods, would pass the mound on the slow line, reverse towards Sleaford and then pull forward onto the link line, where they would park up for an hour or so, to be checked over before returning to Doncaster. When we arrived at the Junction, from the mound we could see if there was a ’Trial’ on the link line and what class it was, but it was not possible to identify from there exactly what the loco was. So we had to race down the field, through a farmer’s access tunnel under the main line and then diagonally across another field to the far side, where the ‘Trial’ would, hopefully, still be sat there. 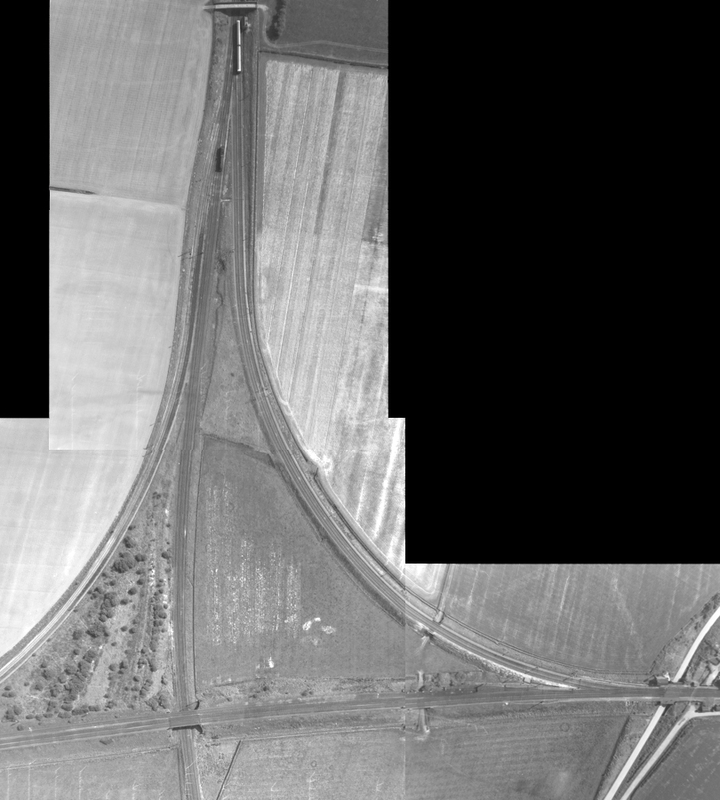 A combination of three aerial photographs to show the lines described by Mike. Very, very occasionally this effort would be rewarded by an invitation from the driver to spend a few minutes in the cab, as evidenced by my mate John peering out of the cab window of ‘Britannia’ No. 70005 John Milton. Britannia No. 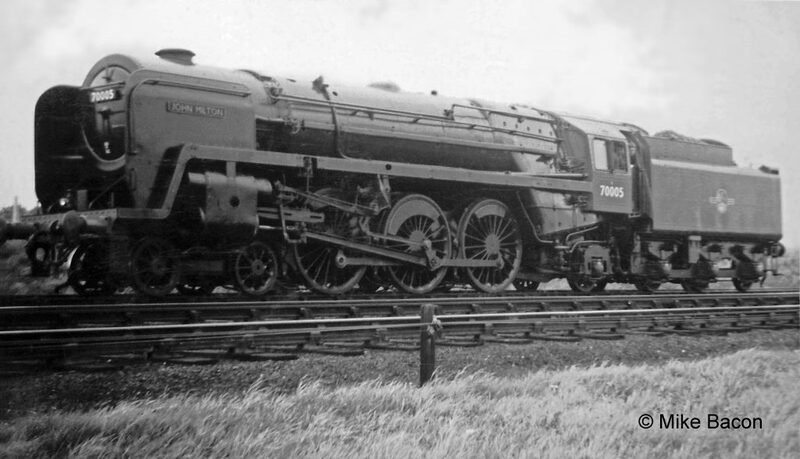 70005 John Milton stands at Barkston Junction on trial from Doncaster Works following overhaul, photographed from point 'A' on the plan of Barkston Junction. At this time in its career it was based at Stratford shed in East London (30A), working out of Liverpool Street station on express services to Ipswich and Norwich. 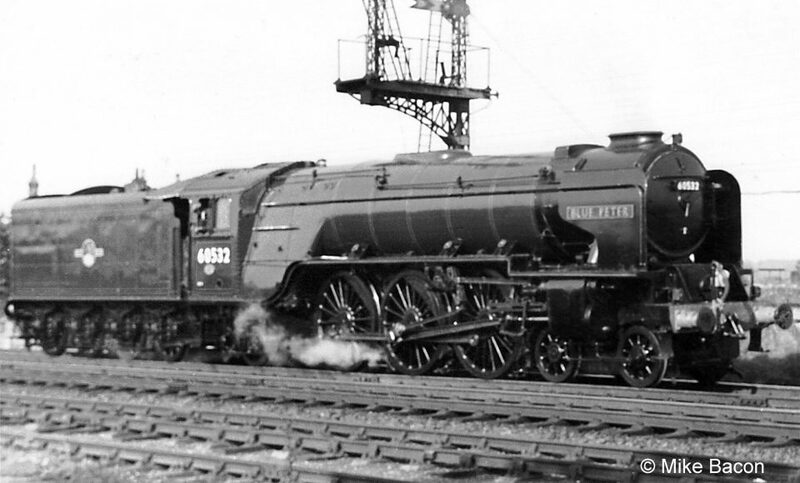 Probably my favourite ‘Trial’ is A2 60532 Blue Peter (of 61B, Aberdeen Ferryhill); it looked absolutely stunning as can be seen in the photograph. Class A2 No. 60532 Blue Peter was based at Aberdeen, so it was a very rare sight in the Grantham area, usually only seen when on trial from Doncaster Works to Barkston Junction. Here it is near Barkston station (point 'B' on the plan), in reverse gear, preparing to take the Sleaford line as far as Barkston East Junction. No. 60532 re-entered service on 28th August 1958 following a Heavy Intermediate repair at Doncaster, so Mike's photograph may have been taken a day or so earlier. Another of my ‘Trial’ favourites was, again, a rarity – A3 60101 Cicero (of Edinburgh Haymarket, 64B) – but unfortunately I had no camera with me, unlike the time 60043 Brown Jack (also of Haymarket) appeared out of the blue on a southbound fast freight, the photo of which was taken with a horizontally-held box camera! A rare 'cop' at Barkston - A3 No. 60043 Brown Jack was captured by Mike with a box camera of a type which had to be held at waist height, looking down into a viewfinder from above. The photograph was taken from point 'C' on the plan. 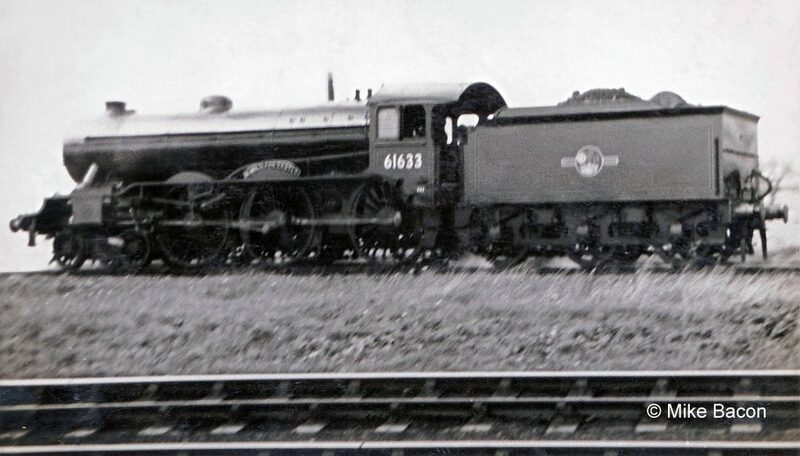 Other ‘Trials’ could be locos shedded much closer to Grantham but, as with K3/2 61868 and B17/6 61633 Kimbolton Castle in the photographs, they too could sometimes be locos which would not normally venture into our area. Class K3/2 No. 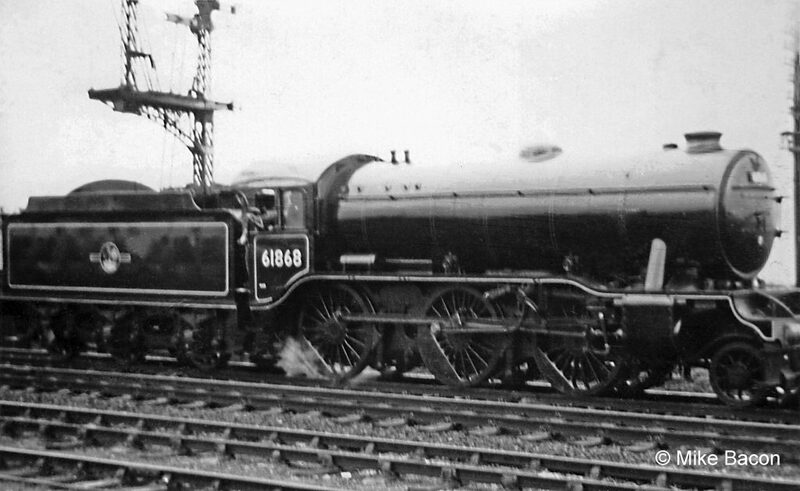 61868, photographed from point 'B' on the plan. This 'Jazzer' worked from Mexborough shed, between Doncaster and Rotherham. 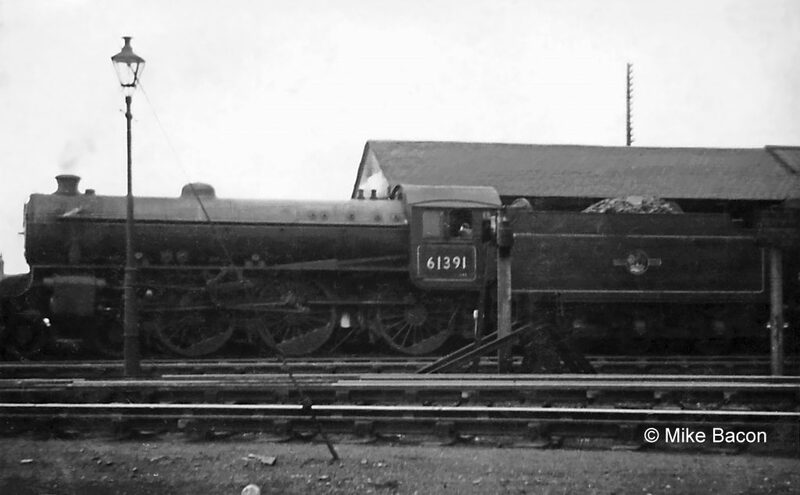 Class B17/6 'Sandringham' No. 61633 Kimbolton Castle of March shed (31B), fresh from overhaul at Doncaster, stands on the East-to-North link line at Barkston Junction before returning to the works for attention to any defects the crew may have noticed during the trial. The photograph was taken from point 'A' on the plan. We also trainspotted at Grantham, of course, and very occasionally I visited the Station, as can be seen in my photograph of A4 60003 Andrew K. McCosh in the ‘classic’ Grantham viewpoint at the south end of the main platform on an Up express. That was not, however, our preferred spotting place. Probably the ideal spotting location would have been a large flat area of disused land just inside the Loco gate (near to where the old turntable used to be), off the passage-way under the main line leading to Station Road. It commanded excellent views of all northbound, southbound and Nottingham line activity and also of the Loco itself but, unfortunately it was a no-go area, being regularly patrolled by the British Transport Police, in particular by a rather zealous Constable Gibson. A few of the Loco staff could be less than friendly too. A couple of my photographs (B1 61391 and English Electric Type 4 D201) were taken from this vantage point, but normally we kept away from here as the risk of being ‘collared’ was too great. Class B1 No. 61391 stands at the Western Platform. English Electric Type 4 diesel-electric locomotive No. D201 was 'nearly new' when Mike saw it in the loco yard at Grantham. 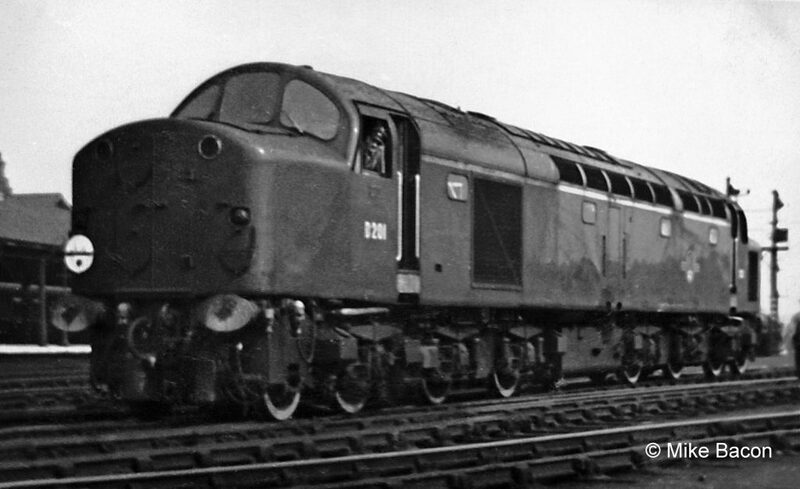 D201 entered service with British Railways at Stratford shed early in April 1958. The following month it transferred to Hornsey on the East Coast Main Line, when it was more likely to be seen at Grantham. 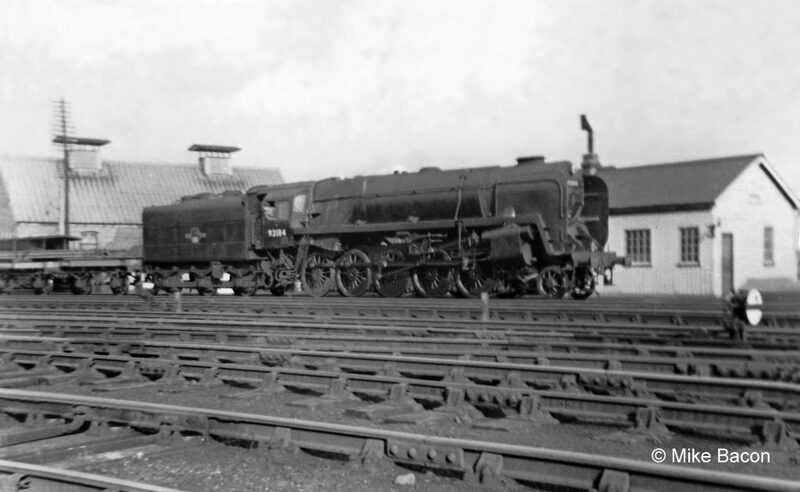 The arrival of these locomotives heralded the end of steam power between King's Cross and the North, though problems with their reliability kept the fleet of steam locos rostered to some of the most prestigious express services until the arrival of the Deltics in 1961. Talking of being ‘collared’, I was once apprehended by another BTP Constable for riding my bike through the tunnel from Station Road to Huntingtower Road. After taking my details, he later turned up at my house and gave me and my parents a real lecture about the dangers of my actions to pedestrians and the perils of trainspotting. I thought that this was to be the end of the matter, but I was then stunned to receive a summons from the local magistrates. I was spared the experience of actually going before the magistrates by pleading guilty to my ‘crime’ and was duly fined 10 shillings – quite a bit of money for a young school lad. All in all a bit over the top, I think. Our favourite trainspotting location was on Springfield Road, where a sloping flat-topped retaining wall ran from the main Loco entrance to the railway bridge. We and a group of other pals from the Springfield Road area used to sit on top of this wall where we could see all north and southbound activity and could climb up on the buttress to see if anything interesting was taking place in the goods sidings or to take occasional photographs, for example my pictures of B17/1 61625 Raby Castle and 9F 92184. 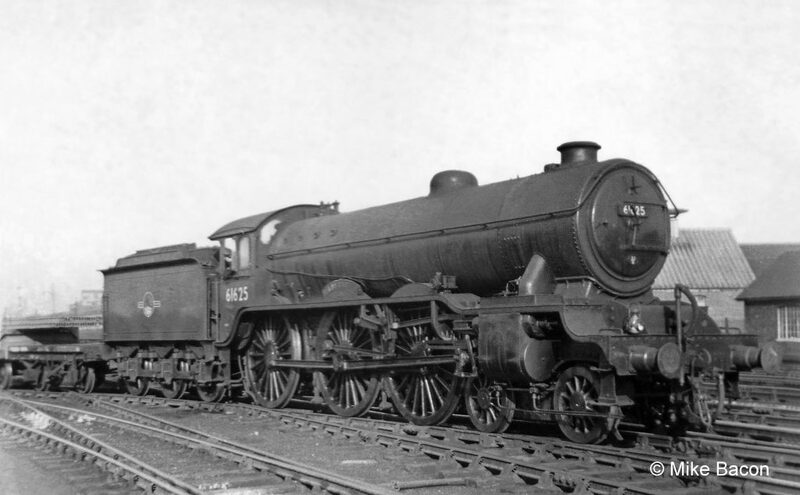 BR Standard Class 9F heavy freight locomotive No. 92184 with a southbound freight, photographed from the wall near Springfield Road bridge. The wall near to Springfield Road was also handy for nipping up to see what was turning round on the ‘Triangle’ (as seen in the photograph of A3 60103 Flying Scotsman turning alongside Springfield Road) or ‘bunking’ the New Shed; in winter it was usually possible to find a loco in the ‘dead’ line with the remnants of a fire still in it to get warm by. The aforementioned Constable Gibson used to regularly give us grief, moving us off the wall, making us move our bikes across the road, chasing us out of the Loco etc. He never managed to catch any of us actually in there, but we had a few narrow squeaks! No. 60103 Flying Scotsman is turning on the triangle beside the shed - the houses behind face onto Springfield Road. The locomotive's reversing gear is in mid-gear because the driver is in the act of changing direction at the western apex of 'the 'angle'. I do remember one particular incident, though. Word got round that there was a REAL ex-Works rarity on shed – the sole K1/1 61997 MacCailin Mor from 65J (Fort William). We duly investigated and, sure enough, it was there - tucked away in the Old Shed. What a Cop – possibly the rarest loco ever to turn up at Grantham! This was relayed back to another mate at school, not such a regular spotter and less familiar with the BTP officers. He duly set out to cop 61997 and try to photograph it. A pathway ran behind the loco back wall and along the turning triangle fence, through the allotments and up to Springfield Road; part way along this back wall, another wall that you could walk along the top of ran at right angles to it towards the Loco, with a decent view of the Old Shed from the end of it. This was the chosen vantage point for the hoped-for photograph; my mate had just about got there when a Constable appeared and confronted him. 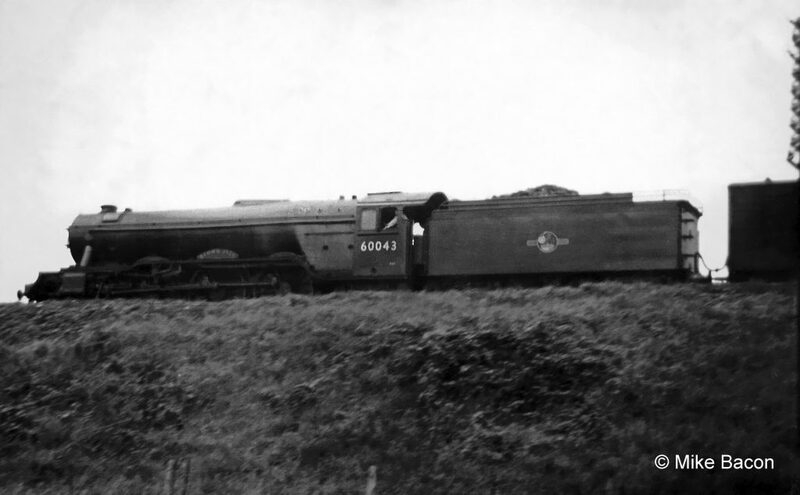 He explained that there was a very rare loco there, that he just wanted to take a picture of it, and that Constable Gibson had said it would be OK if he was quick. “Oh really...,” said the Constable “...I am Constable Gibson!” No happy ending, I’m afraid. My mate was fined, didn’t get his photograph and, if I remember rightly, 61997 wasn’t far enough out of the shed for him to even ‘cop’ it. By this time, as ‘cops’ became harder to come by locally, we were also venturing further afield, occasionally visiting places such as Melton Mowbray, Leicester, London, Manchester, Derby and Crewe to spot locos from other regions. However, none of them ever had the appeal and sheer charisma of the ECML Pacifics and V2s, and it was always nice to get back on home territory in the hope of something unusual turning up. Unfortunately, my trainspotting days eventually pretty much came to an end when I left school and started an apprenticeship at local engineering company Ruston & Hornsby, a five-day week from 7.30am to 5.30pm leaving little free time to pursue the hobby. Also, by this time, alternative interests such as girls and rock and roll were starting to come into play. I bought an electric guitar and started to learn to play it, got together with a new pal I met at a local dance and, before we knew it, we had got together a band (or ‘beat group’ as they were then called). That was it - loco numbers no longer had the same appeal, I’m afraid. 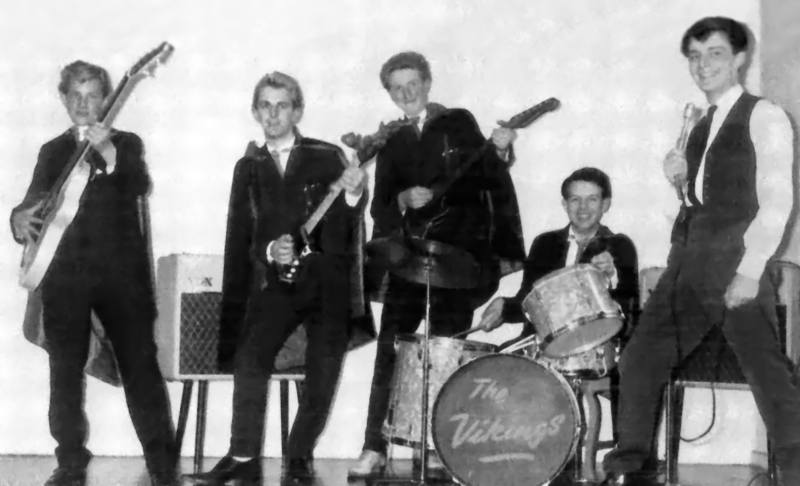 My first group The Vikings - I'm second from the left. The tall lad in the middle is my long-term pal Gordon Staniland, referred to in the text as being the one that first got us together to start the band. The singer, on the right, is another mate, Ron Frisby; he and I are now actually back performing together (after about 54 years) in a little 4-piece rock'n'roll band called Rainbow Days. The name refers back to the times the local bands spent in the Rainbow Café in Grantham on Sunday afternoons listening to the latest hits on the juke box after their Saturday night's gigs. Note my blond hair; I'd had it peroxided almost Jayne Mansfield-blonde, but it had started to look a bit darker by the time the picture was taken!! Looking back, the demise of steam had already started by then, and it was sad to see many of those magnificent Pacifics in such a poor state in their final years. I’m sure we saw them at their best in the 50s and I enjoyed every minute of my spotting days with my mates – I wouldn’t have missed any of it. Great Days! This article and the photographs brought back for me so many memories of happy trainspotting days in Barkston and Grantham. My mum ultimately dumped all my notes and photos apart from two combined volumes and a shed book, and so my own trainspotting articles eighteen months ago were from memory. A question - why is that I can still name most of the Eastern Region Pacifics in order from over fifty years ago, but struggle to remember my wife's shopping? By the way, which John was it on the footplate of the Britannia? It was good to meet you again at the recent Return To Grantham get-together after all these years. Shame about your lost notes and photographs, but at least you have your 'Combineds'. Mine unfortunately disappeared along with a number of shedplates, including a rather rare one from Market Harborough; some of these would have been quite valuable at the Railwayana auctions. Ah well, never mind! I suffer from the same problem; A4s, A3s, and most A1s I can still remember, but A2s are a little more hazy! The lad in the 'Brit' was John Aspland, who I still see in town quite regularly. I will be attending the next get-together in the Spring, all being well, and look forward to meeting you again if you are able to be there. I thought that it would be Jonnie Aspland. Please give him my compliments when you see him next. Hopefully will see you in the spring. It was wonderful to read about your happy memories of Barkston South Junction and standing on what was, and still is, the mound. I still visit Barkston and its surrounding area on regular visits. It is a shame the trees on the opposite side of Marston Road have taken away the view towards Hougham and on to Claypole. My parents were licensed victuallers at 'The Stag' public house in Barkston and Mr Parker and Mr Dale, who were both signalmen at Barkston South, visited the pub with information about 'trials' expected on the north spur of the triangle. Mr Tuplin the farmer used to let us go through his farmyard to Barkston East Junction and over his ‘occupation’ bridge to the hedge side, to where the 'trials' usually stood. The driver and fitter would check all the bearings for hot boxes and lubricate and usually I was able to cab the loco. I am able to boast of cabbing all 34 of the A4s, along with other numerous and more rare locos. Sadly I also lost all my photographs and notes, but I still have clear memories of living in Barkston and going to the same places as yourself. When do you have your next meeting, as I would like to chat about those happy memories? Thank you for your comments about Mike's page - memories like yours help to bring our pages to life. I'll let Mike know you've been in touch. Our next project get-together at Grantham Railway Club will be in October. We hope to announce the date in the next few weeks. If you like we can add you to our contacts list so you will receive information by email when it's available. I'm pleased you enjoyed reading my page - happy memories indeed. If only my mates and I had had the benefit of such invaluable "insider information" at your disposal..............it might not have taken me anywhere near as long to "cop" my last A4, 60012 Commonwealth of Australia, not at Barkston though, but at the Kings School playing field, on the Up "Lizzie". I've unfortunately missed the last two Tracks through Grantham get-togethers due to other commitments, but hope to be at the October one, all being well, and it would be good to have a chat about those old days.